This quiche makes for a great dish to serve at parties. 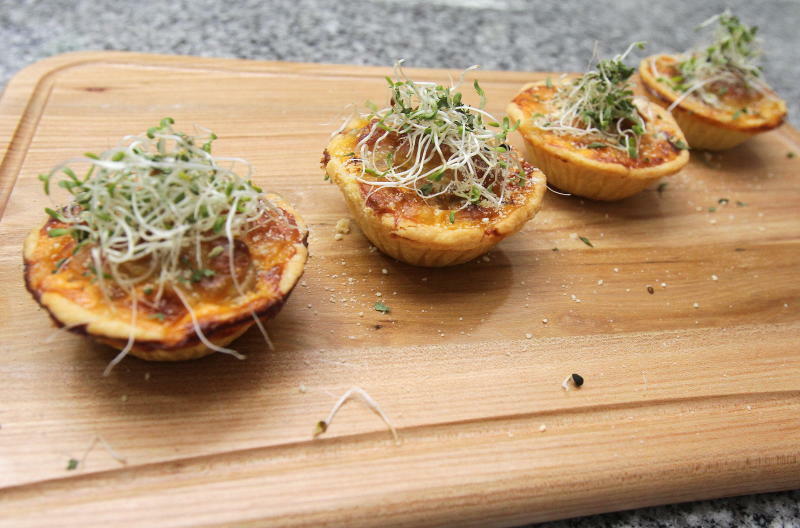 The tartlets also make for a convenient on the go snack that you can pack for your child’s breakfast or lunch. Mix the flour, milk powder, salt, unsalted butter, cold water and egg yolk by using a mixer that has been attached with a paddle. Make a dough ball, wrap with cling wrap and chill for at least 30 minutes. Take out from chiller, press into 10" pie crust or small tartlet casing. Keep aside for later use. Preheat oven to 165°C. By using a medium-sized pot, melt unsalted butter in a skillet over medium heat and sauté garlic, onion, tuna, diced tomato and oregano for 5 minutes or until tender, stir continuously and remove the pot from heat. In a 10” inch round pan or pie plate coated with non-stick cooking spray or small tartlet casings, press the pie crust dough onto the bottom and side of the pan to fill in any gaps. In a medium bowl, stir the cooked ingredients together with cooking cream and eggs, then season with salt and pepper to taste. Stir in the shredded mozzarella and shredded colby and cheddar into the egg mixture until well combined. Pour the tuna filling into the prepared crust and add in the sautéed ingredients on top. Top with mushroom slices and shredded cheese. Baking time is estimated to be within 20 minutes or until its golden brown. Ensure to cut only after the prepared quiche is at room temperature so that it will not break or crack.